Happy Birthday to me...I think I deserve some Teuscher truffles! Today is my birthday and what better way for this chocoholic to celebrate than to have some fine chocolates...or at least blog about them. I don't have time to make my way over to the Teuscher Chocolates store today but wanted to share a lovely idea for wedding favors. I was introduced to their specialty all-natural Champagne Truffles when this beautiful green box landed on my desk by a former manager for Christmas one year. Sixteen truffles and I believe I finished them all in two days! 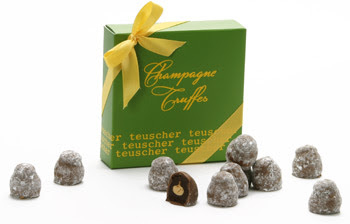 Teuscher's signature Champagne truffles are filled with Dom Perignon and received the honor of "the best champagne truffles on the planet" by the Zagat Survey! A two piece favor box is just $6.75 each and comes in a variety of colors to match your wedding or special event. Delight your guests with this special gift to thank them for sharing your special day! Something Blue Dress House in Las Vegas is offering 50% off sample dresses!